Saints and Soldiers: Airborne Creed is an intense, character-driven World War II drama that follows the dangerous journey of a band of U.S. Paratroopers who fight their way across Nazi-occupied France. My long-time audio post colleague Carlos Sanches presented me with the chance to work on this film with him, and I eagerly accepted the gig. This project was lots of fun to work on, but definitely a tall order on the sound effects front. Having been tasked with building all the backgrounds and ambiences, cutting all sound effects, and building a unique tapestry of design for the many flashback sequences in the film, I broke each task down into smaller sub-tasks in order to avoid becoming too overwhelmed. The first step was to create the world for the film, so to speak. Thankfully, the story favored very naturalistic and lush settings rather than urban and human-infested ones. This is great for a backgrounds editor, as it gives one much room to stretch sonically: Dense, haunting and echoey forests. Dry and dusty, windswept fields. Hollow, ghostly barns. I love that stuff, and if the cinematography is good (which thankfully it is! ), then its easier for me to hook into the material. My approach to backgrounds for "Saints and Soldiers" involved cutting thick, rich layers, while accenting key "events" in a scene to make the moments pop. A rushing river set in a dense forest. A fly buzzing in and out of frame as soldiers make their way across a hot prairie. A lonely wind howling through the planks of an abandoned shed. When timed appropriately against the dialogue, incidental sounds (distant bombing, single bird or cicada, etc) can really help enhance the soundscape. Once the real world had been laid out, I then began to blend surreal elements into the soundscape to enhance the mood of the scene. In my approach, this surreal sonic layer is its own separate entity intended to fill in that gray area between natural backgrounds and actual, specific sound design created for the designy moments of the film. This layer acts as an atonal, subconscious buffer between the different sound editorial tasks, and is meant to round out the entire audible experience. In conjunction with the evolving turbulent physical environments, this design layer can help heighten and personify the characters' internal struggles. In many instances, I utilize anything from processed winds, screams and/or howls, pitched and modulated drones, as well as other fun eerie "stuff." Again, at this point, I'm not hitting any specific, visually driven sound design, but providing a layer of mood for the sound design in which to play. There is a particular interrogation scene in "Saints and Soldiers" that takes place in a deep, "overcast" forest, with lots of branches swaying and wind blustering. It's beautifully shot. Daunting and bleak, and a perfect place for sound to really heighten the tension of the moment, as well as provide a voice for one of the lead character's internal conflict. Sorry, can't say much more without revealing too much! Okay, so backgrounds are done at this point. After delivering them to Carlos, I then proceeded to tackle one of the more detailed, intricate and precise tasks of the film: The Weaponry. Gunfire, bullet impacts, bullet ricochets, bullets whizzing through air, bullets hitting tanks, walls and people, gun cocking, rifle bolt action, tanks, grenade launchers and mortars firing, missiles impacting. There are several tasty firefights throughout the film, all of which had lots of different perspective shifts to keep the audience engaged. Of course, one cannot do a weapons pass without covering the bodyfalls, debris and explosions as well, so the first official pass of sound effects was extremely hefty and super detailed. I don't even want to think of the number of late nights I put in for this one!! By this point, my brain was mush, but I was having a great time! For my second sound effects pass, I covered everything else. Dog vocals, doors, military transport vehicles, German and American fighter planes, tanks, camera clicks, etc. I also designed character-specific elements meant to get us in and out of the American soldiers' flashbacks. By this point in the process, I was able to pull the uncut Foley into my session and use it as a guide to see how much had been adequately covered and what could still use an extra "umph" from the sound effects. I delivered the rest of the material to Carlos to incorporate into his mix session, and soon afterwards, I began a subsequent pass of fixes and tweaks, as well new adds for the recently-delivered final visual effects (which included new visuals on airplanes and bullet tracers). 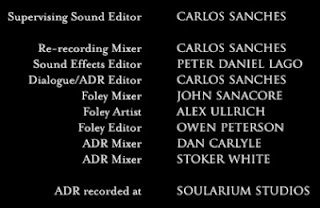 As of this writing, the final mix for Saints and Soldiers: Airborne Creed is just about done, and I've got to say that I'm very happy with what Carlos Sanches has done with the dialogue, music and sound effects. All the different elements blend well quite poetically, and the big sound effects dance well with the heroic and nostalgic score (courtesy of the talented J Bateman). The experience was amazing for me, partly because of all work I was tasked with on this film, but also because I got the chance to work directly and indirectly with seasoned, creative and efficient audio professionals whom I admire. 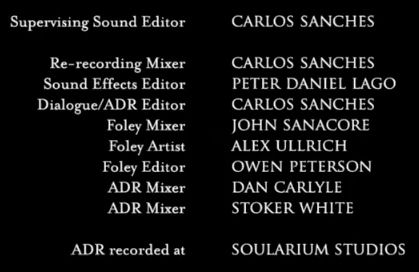 Big thanks to Carlos for getting me involved with this project, and thanks to John Sanacore and Alex Ullrich for some really great-sounding Foley! I'd also like to thank Ryan Little, Gil Agluare, Adam Abel and everyone else at Go Films for letting me be part of the experience!